Frank Buckley is the CEO of Down Syndrome Education International and Down Syndrome Education USA. Frank is the son of Professor Sue Buckley, the founder of Down Syndrome Education International. One of his sisters has Down syndrome. Frank has worked for DSE since 1997 in a variety of operational and financial management roles. During this time he has played a central role in the development and growth of the organisation, helping to establish the charity as a leading international information, services and research provider. He was appointed CEO in 2007. Frank has also led the development of a successful outreach programme, including securing funding to help the Ukrainian Down Syndrome Organisation to develop and expand. In less than three years, the organisation became established as a major service and information provider serving hundreds of people with Down syndrome and their families throughout Ukraine. Frank is a regular speaker at major conferences, including Down Syndrome Affiliates in Action annual conference and the National Down Syndrome Congress annual convention. He is a member of the Informed Decision Making Task Force. 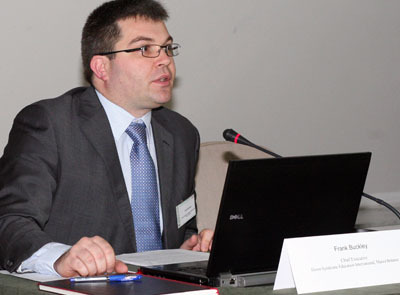 Frank currently also serves as a Vice-President of the European Down Syndrome Association. Frank was educated at Portsmouth Grammar School and Wells Cathedral School . Frank's elder sister has Down syndrome. Frank married Angela Byrne in 2003. They have three young boys. Frank is a Fellow of Royal Society for the encouragement of Arts, Manufactures and Commerce (The RSA), a member of the Institute of Directors and a member of the Association of Chief Executives of Voluntary Organisations.